An antique woodcut engraving which was published in "The Graphic" on June 7th 1873 with later hand colouring. This colour printed chromolithograph is from "The Rules of Golf Illustrated" by Charles CROMBIE originally published by Perrier Ltd. Circa 1907. Line of verse below image. Some old restoration on verso. This colour printed chromolithograph is from "The Rules of Golf Illustrated" by Charles CROMBIE originally published by Perrier Ltd. Circa 1907. Line of verse below image. Perrier logo on verso. Antique woodcuts drawn by Ralph Cleaver which were published in "The Illustrated London News" on April 20th, 1895. Later coloured by hand. Golf Match between Royal Blackheath and London Scottish Clubs at Wimbledon. 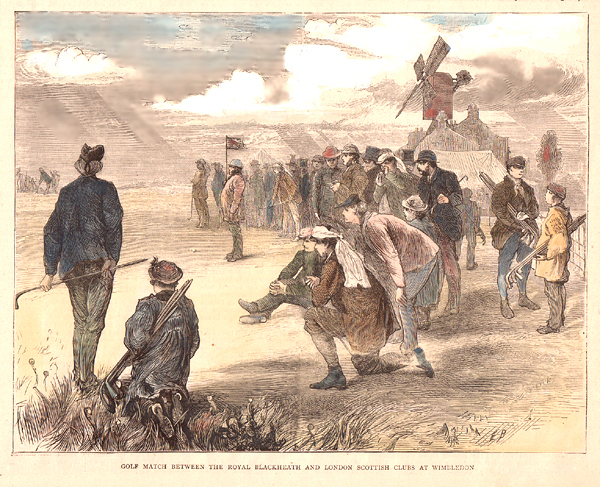 A woodcut engraving entitled "Golf Match between the Royal Blackheath and London Scottish Clubs at Wimbledon" published in "The Graphic" on 4th June, 1870. The colouring is later. A beautifull coloured plate laid on thick card which was published in "A Golfers Gallery by Old Masters" by Bernard Darwin. This was illustrated with eighteen full-page mounted colour plates of paintings depicting golf or golf relatives in different forms from the 16th to the 19th centuries. Circa.1920. Henry Callender by Lemuel Abbot. Mr William Innes by Lemuel Abbot. A woodcut engraving published in "The Illustrated London News" on 26th March, 1879. The colouring is later. 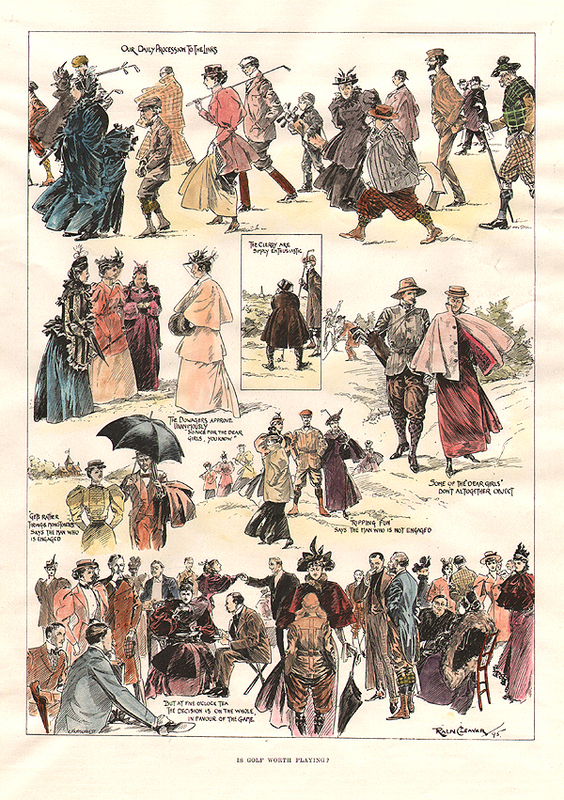 This plate is from "The Rules of Golf Illustrated" by Charles CROMBIE originally published by Perrier Ltd., in 1905. The colouring is original. Some dirt and scratches present on the surface of the print. Woman's Golf as Against Man's Golf. A woodcut engraving entitled "Woman's Golf as Against Man's Golf - The Leitch - Hilton Test" published in "The Illustrated London News" on October 22nd 1910. The colouring is later. Sketches and account is of the game between Miss Ceilia Leitch and Mr H.H. Hilton at Walton Heath Club. The St. Andrews Ladies' Golf Club. A woodcut engraving entitled "The St. Andrews Ladies' Golf Club" published in "The Illustrated London News" on October 12th, 1889. The colouring is later. 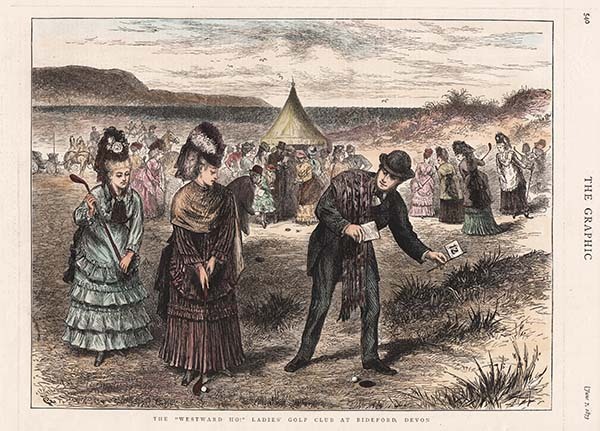 A woodcut engraving entitled "Troubles of Amateur Golfings" published in "The Illustrated London News" on March, 16th, 1889 The colouring is later.